Will the European Union have its ¿single family - a ¿European family - as it will have a single currency? This is the question at the origin of this book. 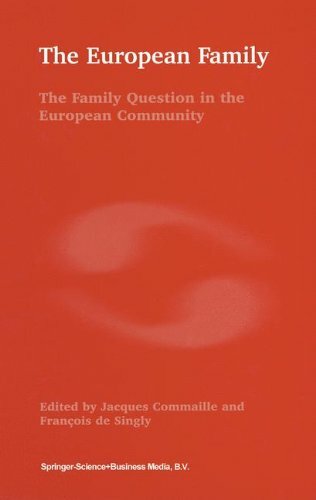 Studies of family behavior and the organization of private life among European citizens, as well as of family member social status (children in relation to adults/parents, women in relation to men), and of social functions of the family, for example social reproduction, reveal so much convergence among European families that the reality of a ¿European family seems inevitable, and more so if one looks at foreign studies done - in Australia, the United States or Japan - of the family in Europe. However, studies of the different judicial and public policy laws in the different European Union member countries lead one to refine this first impression. The family does not have the same legal meaning in all places, and the ways in which it is defined by law and public policy continue to differ strongly, due in particular to historical factors, cultural traditions, and conceptions of the role of the State. In order for the family to be part of the construction of a European citizenship, the pluralistic nature of its political definitions will have to be recognized. Putting the family into the context of evolving European integration has never been done before. It was made possible in this study thanks to the joint efforts of two editors with long experience in social science studies of the family and as expert advisors to the European Commission, and by the work of the best international specialists in the field. This is a book intended for specialists working in the social sciences, for social and government policy-makers in the fields of family and social policy, and for all those interested in European integration. View More In Family Health.